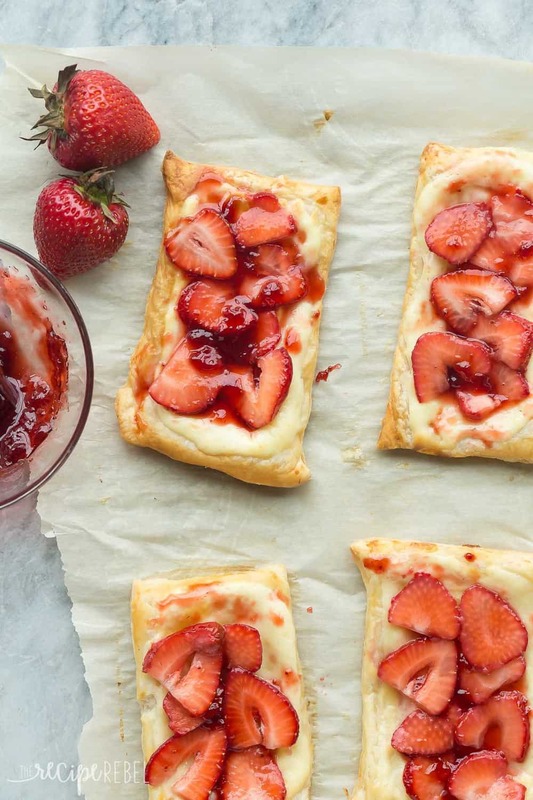 These Strawberry Cream Cheese Danishes are an easy breakfast or dessert that’s perfect for summer! 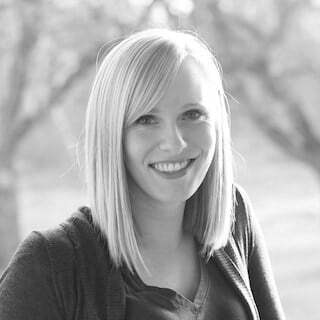 Happy June everyone! 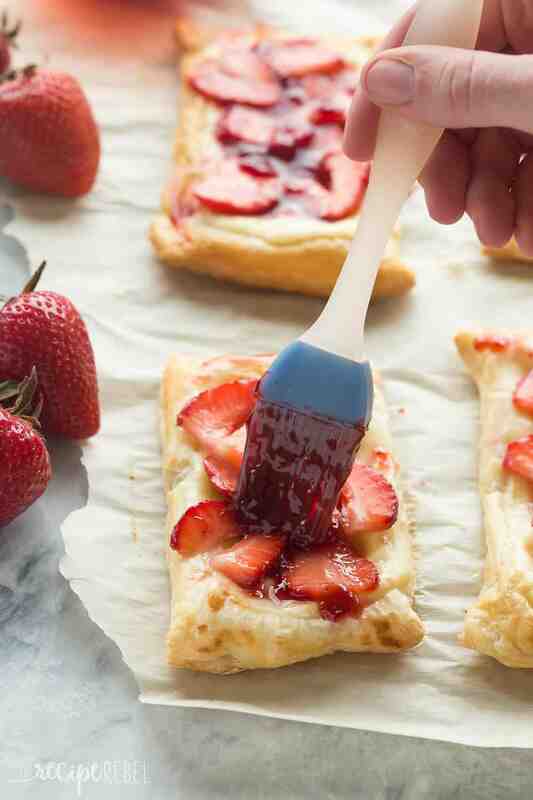 It’s Ashley from The Recipe Rebel here with my new favorite way to make those fresh strawberries extra special (as if they need any help!). Maybe you’re one of the lucky ones who has access to fresh local strawberries early in the Spring, but not up here where we are. We are still anxiously awaiting the day but it is coming soon. I’m ready with all of my favorite strawberry recipes! 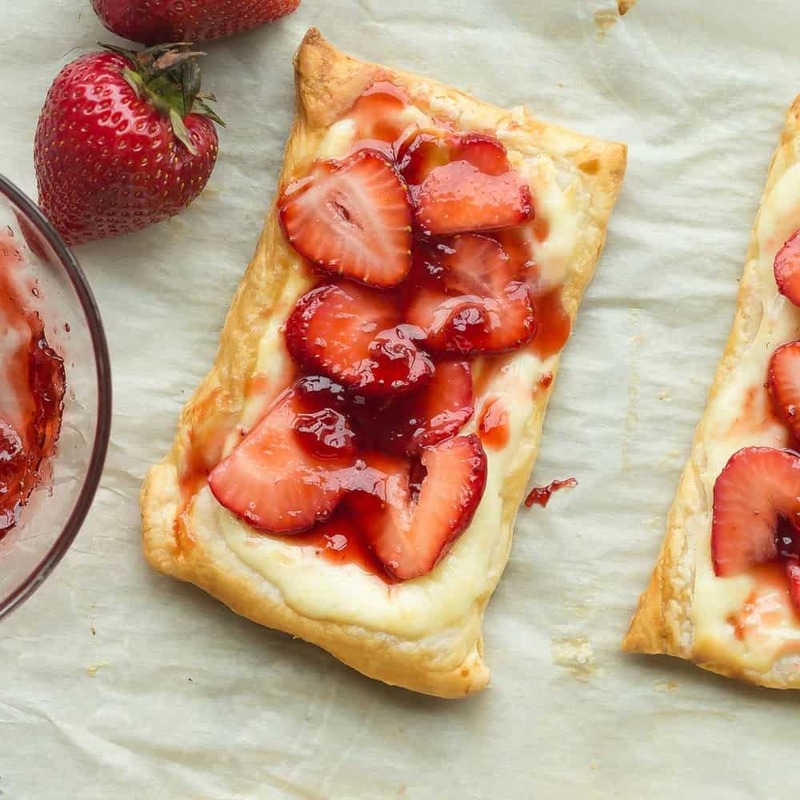 These Strawberry Cream Cheese Danishes really couldn’t be easier: they’re made with store bough puff pastry (I always keep a box or two in the freezer for quick fixes! ), a simple cream cheese mixture and topped with fresh strawberries. For the topping, I warm up a little strawberry jam to brush over top — it’s an easy way to keep those strawberries looking and tasting their best even if the danishes aren’t devoured immediately (although I’m not sure why they wouldn’t be!). Feel free to use raspberries and raspberry jam, blueberries and blueberry jam, or a mixture of fruit with any jam or jelly of your choice. The options are endless! If you prefer, you can definitely add the strawberries before baking, they will just be quite soft and they won’t be quite as pretty. For me personally? I love the texture the fresh strawberries give to these danishes! With Father’s Day and the 4th of July coming up, I am pretty sure you can think of a good enough excuse to indulge in these perfect little bites. You can switch up the fruit and add some blueberries as well for a red, white and blue breakfast or dessert that’s quick to whip up! 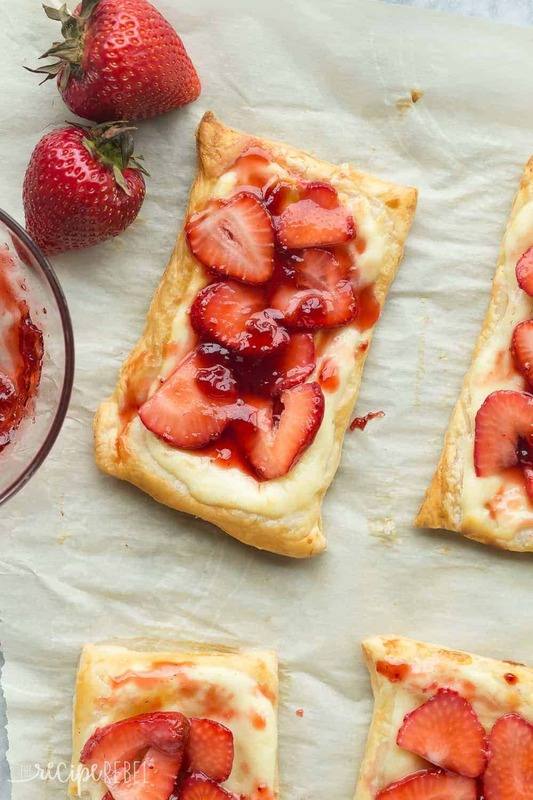 These Strawberry Cream Cheese Danishes are an easy breakfast or dessert that's perfect for summer! In a medium bowl, beat cream cheese, sugar and egg yolk with an electric mixer until smooth. Roll out puff pastry into a rough 12" by 12" square. Cut in half down the middle and cut each side into 4 pieces. Divide cream cheese mixture between 8 pieces of puff pastry and spread to within ½" of the outside. With a fork, beat egg white and water until combined. Brush around the exposed edges of the puff pastry. Bake for 15 minutes or until golden brown. Remove from the oven and let cool 20-30 minutes. Top with a layer of strawberries and brush with jam. Serve immediately. Cover leftovers loosely with plastic wrap and serve within 6-8 hours. These look beautiful and definitely give me the summer feels!